eBay Powered by Frooition About usShippingReturnsContact usPaymentFAQs All Items See our eBay store for more great items >> Shop CategoriesDatelSonyTomeeCirkaGamesMicrosoftSandiskRetrolinkPs4Xbox ( Original )Xbox 360Wii3ds/3dsxl/3dsi/2dsPs3Ps2GamecubeN64GameboyIphonePcMemory cardMayFlashIviewSamsungHtcHpPs1DSDSI3DSWIIPS2PSPPSVITAPSXWII UXbox OneACCESSORIESGoogleHyperkinTTXAppleNintendoBraunJBLAmazonJVCPioneerLGPhilipsTCLIVIEWKenwoodNikonFujifilmPentaxCanonVizioOlympusNokiaRCAat&tNintendo SwitchMagnavoxEpsonKodakPlaystation 43DS XLXbox one SPlaystation VRSpeakersControllersCablesCasesCamerasSNESNESAntennaHomeworxMotorolaHeadset Red Dead Redemption 2 - PlayStation 4 New Item Description Developed by the creators of Grand Theft Auto V and Red Dead Redemption, Red Dead Redemption 2 is an epic tale of life in America’s unforgiving heartland. 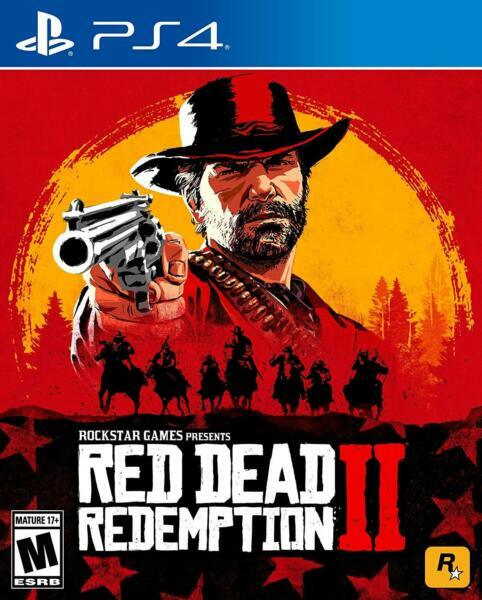 The game's vast and atmospheric world will also provide the foundation for a brand new online multiplayer experience.Developer: Rockstar StudiosPublisher: Rockstar Games About UsAbout UsPaymentShippingTermsReturnsAbout UsWelcome to NationWide Distributors! We carry many brand names such as HP, Apple, iPhone, Canon, Braun, Philips, iPads, Nintendo, Samsung, Cisco, Kodak, Pandigital, Microsoft, Motorola, Samsung Galaxy, Android, Dell and tons more!PaymentPaymentWe accept Paypal only. All payments due Within 3 days after auction ends. TAX 9.25% sales tax for items ship to anywhere in California , and this is a law, that all sellers have to follow.ShippingShippingAll orders valued over $350.00 will require a signature upon delivery. Any orders for Next Day Air placed after 1PM PST will go out the next day business day We only ship to Paypal Confirmed Addresses, no exception! We ship to Puerto Rico. We only ship to US and Canada. All inquiries to ship to other than US and Canada will be ignored. All of our items are shipped USPS or UPS or FedEx with a tracking number. All items will be shipped the same day or the next day after the payment is fully received or cleared. We will provide the tracking number to your Paypal registered email address once your item ships. Standard shipping cost to anywhere in the continental United States is FREE. Residents of Canada, Hawaii, Alaska, Guam, Virgin Islands or APO/FPO addresses, please contact us prior to bidding for a shipping quote. Any taxes, duties or brokerage fees for anything shipped outside the US is buyer's full responsibility.TermsTermsPlease note if you email us please leave a detailed message and a customer service representative will reach out to you within 24 hours. ReturnsReturnsE-mail us for a return authorization and reason for your return within 30 days of receipt of a product NationWide Distributors will accept returns for product purchased from us within 30 days from the date of purchase for a refund or replacement under the following conditions and with exceptions to below points: 1.Shipping charges are not refundable. Only the purchase price of the product is refundable. Customers remain responsible for the shipping and handling expenses incurred in shipping the item to them. If an item is offered with Free Shipping, it means that we are paying the freight on behalf of the Customer. In this case, if that product is returned for a refund the shipping expenses incurred, will be deducted from the refund. 2.We will have the cost of return shipping deducted from your refund if you use our postage-paid return label, unless the return is a result of our error. It typically takes up to two weeks to process cell phone returns after they arrive at our returns center. If you haven't received your refund after this period, please contact us so that we can further research the issue. 3.We accept no responsibility for loss or damage items in return transit. 4.Buyer is responsible for all freight charges. 5.All damaged item claims, dead on arrival claims & shortage claims must be made within 24 hours of delivery or the claim may be voided. 6.All exchanges & returns & claims must be in original factory cartons, including all packaging materials, inserts, manuals, warranty cards (not filled-out) and all accessories. Partial refunds/Restocking Fees 7.All returns are subject to 15-20% restocking fee. 8.Any unopened media item or non-media item in original condition that is returned more than 30 days after delivery: 80% of item's price.. 9.Any item that is not in its original condition, is damaged, or is missing parts for reasons not due to our error: up to 50% of item's price Helpful Links Add to Favorite Sellers Sign up to Newsletter View Feedback Contact Seller Visit seller's eBay Shop About Seller Page More Items!View more great items Powered by FrooitionFrooition Frooition | No-js Template | eBay design, eBay store design, eBay shop design, eBay template design, eBay listing design (ver:froo_no_js)This listing is currently undergoing maintenance, we apologise for any inconvenience caused.